One private bedroom in your own wing of our lovely house in the hills of Old Beach. There is a comfortable double bed in the room with the ability to add a single trundle bed. From your room you have views of Mount Wellington, Gunners Quoin and the rolling hills of the greater Hobart region. From around the 5 acre property which you and your pets are welcome to explore there are also views of the water up the Derwent River. 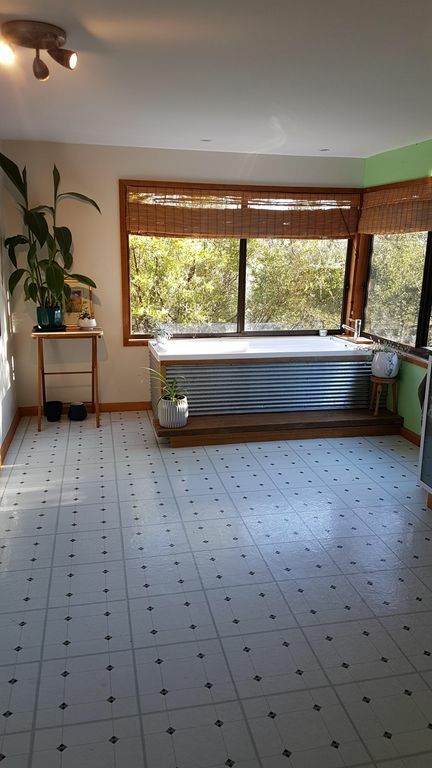 You have access to your own bathroom where you can relax in privacy in the full size bath with more views of the bush. There is a seperate toilet. Your room also has access to a secure yard for your 4 legged friends. We have a cat and a small dog but they can all be kept seperate if necessary and if your animals are used to being with you inside that is generally going to be okay with us too. We have parking available for most campervan sized vehicles and a good turning circle for easy access. Shared washing machine with main house, access is negotiable. Very nice property and house. They are very friendly. The only thing that would have improved our stay would be a sink to wash up in on the guest side of the house. So we didn't feel like we were imposing on their privacy every time. Lovely quiet accomodation, a real taste of Tasmanian country and hospitality. Relocating to Tasmania for work I stayed at this Bush Retreat while starting my new job and seeking longer term accomodation. It was the perfect choice. Location is quiet and comfortable with a real feel of being in the bush while within easy reach of most Hobart suburbs and CBD. Hosts, Rachel and Tom and their dog Lucky, offered a warm, friendly welcome and accommodated my work routine. Sharing the kitchen space was comfortable and resulted in some enjoyable conversations. Overall I'd recommend the Pet Friendly Bush Retreat as a delightful home away from home opportunity. So Impressed, loved our stay. We were initially sceptical about booking as no bedroom pictures were shown, however we were SO IMPRESSED once inside. We were greeted by the very friendly owner & made us feel welcome & like we could REALLY treat the house as our own, and we did. the yard Archie could go to the toilet or play in was very secure. I couldn’t fault this pace and I will definitely book to stay there each time we are in Hobart. The house is based at old Beach in a VERY private setting. No neighbours can see into the yard, which I loved, as I could take Archie outside without getting “dressed”. The bed & pillows were comfy. Thank you owners for having us, we will be back. thanks so much for your review, it's really lovely to know you enjoyed your stay! It is always a bit nerve wracking to open our home to other people and it's reassuring to know you were happy with your experience. We have also added a lot more photos of inside the area now, thank you for that feed back. Great house with friendly owners. Perfect for a short stay during your travels especially with a dog! Very homely feel and nice and local to what Hobart has to offer! The home is on a quiet cul de sac which gives you a great sense of seclusion, particularly at night. The views of Kunanyi and surrounding mountains are just beautiful. I've never seen so many stars at night while still being 20 minutes from the city. There's lots of native wildlife that call this place home. From pademelons, to kookaburras to black cockatoos. It was even common to watch wallaby's from the bathroom while brushing my teeth! I really enjoyed my stay! I would highly recommend it to anyone looking for somewhere in a bush setting, with amazing views and connectivity to Hobart and surrounds.